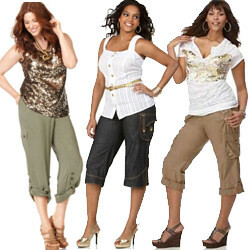 Plus Size Cargo Pants have been a popular casual wear and blue jeans alternative for several years. Before cargo pants became a fashion item in the 1990s, they were pants used for rugged outdoor activities - almost always khaki, oversized and with large patch pockets. Now they come in a variety of styles (including both loose and tight fitting), in just about amy color you can imagine, including denim blue and in a variety of lengths, from full length to cropped and capro lengths and even plus size cargo shorts in the summer.